Also Called: Creeping jenny, small-flower bindweed, possession vine. Stems: Vine, 4 to 80 inches long, slender, decumbent or climbing, twining, glabrous to sparsely and minutely hairy. Leaves: Alternate, simple, variable, ovate or ovate-oblong to triangular, .4 to 4 inches long, .2 to 2.4 inches wide, glabrous or minutely hairy; margins entire or somewhat wavy; tip rounded to sharply pointed; base heart-shaped to nearly truncate, sometimes arrowhead-like; basal lobes blunt or pointed, spreading or pointing downward, sometimes with 2-3 shallow teeth; stalk 1/8 to 1.6 inch long; blade is usually level with the stalk. Inflorescences: Solitary flowers or loose clusters of 2-3, in leaf axils; stalks .4 to 3.6 inches long; bracts 2, scale-like, elliptic, linear or obovate, 1/12 to 1/8 inch long, located .8 to 1.2 inches below flower. Flowers: Calyx bell-shaped; sepals 5, obovate to oblong, 1/8 to 1/5 inch long, margins usually hairy; corollas bell-shaped to funnel-shaped, 1/2 to 1 inch long, shallowly 5-lobed, white to pinkish; stamens 5, unequal, 1/3 to 1/2 inch long, not extending beyond corolla. Fruits: Capsule, nearly spherical to egg-shaped, 1/5 to 1/4 inch in diameter, glabrous; seeds 1-4, egg-shaped, 1/8 to 1/6 inch long, glabrous, dull, rough, brownish-gray to black. Habitat: Open disturbed sites, cultivated and fallow fields, waste areas, stream banks, pastures. Origin: Eurasia. Thought to have arrived in the U.S. in the mid-eighteenth century when it was cultivated as an ornamental and medicinal herb. Escaped and naturalized by the mid-ninetheeth century. Toxicity: The seeds and foliage can cause mild digestive disturbance in livestock, but treatment is generally not needed. Uses: Native Americans used a cold infusion as a wash for spider bites and used the stems as cords to carry birds and small mammals after hunting. Comments: Forms large, dense mats. The flowers open in the late morning and close again by late afternoon. From Latin convolvere "to twine". 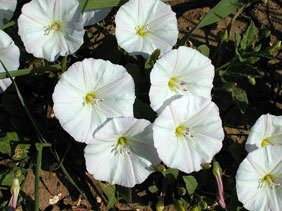 Field bindweed is a serious weed that has been declared noxious in many states. It is very difficult to eradicate. The root system is extensive with roots that can go down to 13+ feet. If cut or dug, the rhizomes that remain in the ground will send up new shoots. The seeds can remain viable as long as 50 years!